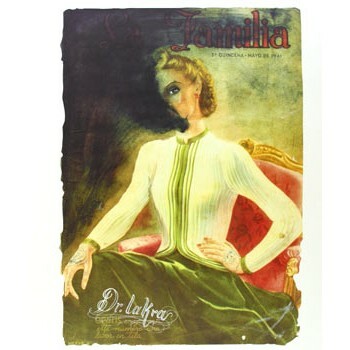 A refined woman gazes elegantly from the cover of a mid-twentieth-century Mexican magazine - its title, Blanca Sol, lays bare the publication's Eurocentric character - but the cover girl's loveliness is compromised by the penciled-in skull that replaces the right side of her face. In another image, a sleek gentleman who might otherwise be debonair becomes fearsome and fierce with the addition of a pattern of contoured lines, like Aztec facial tattoos, over his entire face. This is the work of Mexican artist Dr. Lakra, who superimposes mystical, ancient or funerary symbolism - gang tattoos, bones and skulls, Aztec warrior heads, spider webs, serpents and demons - onto vintage advertisements, girlie pinups, Japanese prints, baby dolls, cast skulls and the like, attaining an effect that resembles a Dia de los Muertos altar slyly erected in place of a kitchen table in the home furnishings section of a Mexico City department store. "In one way or another, the noncivilized human, the nonrefined, the primitive, is always being repressed, in a way that's almost criminal," Dr. Lakra, who also works as a tattoo artist, has said. "I think that through these themes you can define the essence of culture." This lavishly illustrated volume contains 120 color images of Lakra's work, plus a contribution from renowned Mexican artist Gabriel Orozco.